Watching DABANGG 2 is like watching an episode of The A Team. The plot is nonsense, the tone camp, and the audience knowing. But the end result is a bunch of mindless fun that delivers exactly what it promises. In the case of DABANGG 2, that's a funny spoof of 70s Bollywood cop-hero dramas, masala films and "item" girls. And, given that modern Bollywood is at home with Hollywood cliches, the shooting style and score reference Spaghetti Westerns and spoof Zach Snyder's over-stylised bullet-time photography. In other words, this is a film able to mock the faux heroic in Indian and US cinema history, while lovingly recreating the cheap thrills of those genres. It's a film with its heart on its sleeve and its sunglasses clipped to the back of its collar. The plot, such as it is, sees our hero, police officer Chulbul Pandey (Salman Khan) relocate to a provincial town with his new wife Rajjo (Sonakshi Sinha) and father. Chulbul picks up where he left off in the original wildly successful movie, besting up mafiosi with wild abandon, incurring the wrath of local politician and goon Baccho Singh (legendary screen villain Prakash Raj). Naturally, Baccho retaliates against Chulbul's family resulting in an epic final fight. The movie sticks very closely to the formula that made the original a success. Salman continues to combine self-mockery of his pumped up physique with a childish sense of humour. Some of the best scenes in this film see him prank call his father, for instance. The vainglorious hero continues to dote on his wife and have a childish giggle while at the same time murdering goons in outlandish fight scenes. The close similarity extends to the movie's score, which mirrors every song from the original film, reprising playback artists, lyrical motifs and musical themes. Composers Sajid-Wajid are back in charge, and Rahat Fateh Ali Khan's reinterpretation of the first film's breakout hit, Tere Mast Mast Do Nain, Dagavaaz Re is simply beautiful. And in place of Item Girl Munni (who cameos in another song) we now have Kareena Kapoor in Fevicol Se, an instant classic item number which shows that Kareena is the best at self mocking, hilarious item numbers. Overall, DABANGG 2 is not going to win any awards for its deft plotting or originality. And if anything, the pacing and direction by debutant, Arbaaz Khan, is less deft than with the predecessor, helmed by Abhinav Singh Kashyap. But for all that, DABANGG 2 has cracking songs, and loveable, ridiculous hero, who respects his old sweet father. What's more, in its ability to ingest, mock and worship Bollywood and Hollywood history, it provides a more sophisticated brand of entertainment than might at first appear. 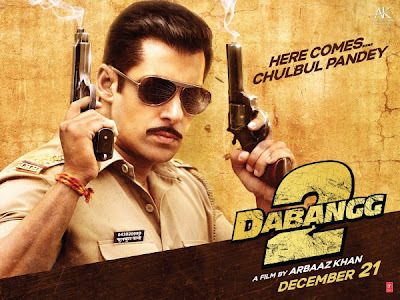 DABANNG 2 is on global release. Itni ghatiya aur bakwaas film hai jise bahut buri tarah se flop hona chahiye magar lagta hai logo ke paas aajkal kuch jyada paisa aa gaya hai.....agar sach me paisa jyada aa gaya hai to bechare kisi gareeb ko dedo yaar..... Bhagwaan aashirwad denge.